Everyone's favorite Old Time Christmas candy is now available in a combo set. You get a 16 oz. 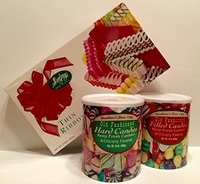 canister of both hard candy and filled Christmas candy along with a 9 oz. box of Thin Ribbon candy. These are our most popular Christmas candies, I am sure you remember eating them at your grandma's house. Many of you probably carry on the same tradition with this old time candy.